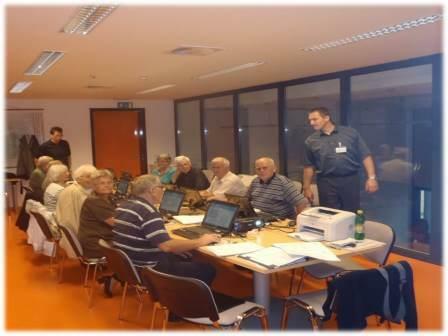 There are many educational opportunities for older people in the City of Ljubljana. Aware of the importance of computer literacy among older people, we were the first municipality in Slovenia which acceded to systematic computer literacy among the older population in 2007. Our goal is to empower older people to start using new technologies and communications.Computer literacy lessons are free of charge for participants. The coordinator is the Office for Local Self-Government, which implements lessons in cooperation with 17 municipal districts. The funds for the implementation of IT courses are provided through the budget of the City of Ljubljana. For 8 years (from 2007 to 2014) we spent 870.000€ and there have been 1121 courses with a total of 11436 participants. The average age of participants was 68 years, and the oldest registered participant was 94 years old. More interest for courses came from women.Computer courses are held in small groups of up to 12 participants and take place at district headquarters. They are organized three times per day (at 8:00, 11:00 and 14:00), every other day and are conducted by professionally trained lecturers with years of experience in working with older people and by and assistant. The participants of computer courses have the option of acquiring knowledge in the basic, intermediate and advanced courses. 35-hour basic course lasts for 4 weeks. Students learn how to draft a simple text on a computer, how to use a browser to search for information and learn about e-mail as a modern way of communication. At the 30-hour intermediate course participants learn how to use USB sticks, learn about computer viruses and antiviral programs, and how to connect a digital camera with a computer and other interesting topics. The purpose of the 20-hour advanced course is that the participants as much as possible independently and confidently use a personal computer. They learn how to edit digital photos, how to use some Google applications (eg. Google earth), how to get acquainted with social networks (Facebook, Twitter) and become familiar with the operation of new technologies in this field (tablets, smartphones).The questionnaires filled out by the participants at the end of the course revealed great satisfaction in the courses. According to participants, courses are held in an extremely pleasant and relaxing atmosphere, which is largely thanks to lecturers and assistants. Participants especially praised their professionalism, their attitude towards elderly and their friendliness. With a relaxed way of working lecturers and assistants have banished the fear of working with a computer.Despite the fact that the project runs already for the eighth year, the interest of the citizens to attend computer courses continues to be extremely high, therefore we will continue with this successful project in the future. The questionnaires filled out by the participants at the end of the course revealed great satisfaction in the courses. According to participants, courses are held in an extremely pleasant and relaxing atmosphere, which is largely thanks to lecturers and assistants. Participants especially praised their professionalism, their attitude towards elderly and their friendliness. With a relaxed way of working lecturers and assistants have banished the fear of working with a computer. We will continue with this successful project also in the future.